Wells Fargo is committed to protecting your personal and financial information and your privacy. If we send you an email that contains your personal or account information, we first encrypt the email to protect your identity and ensure your information is not accessed by anyone other than you. 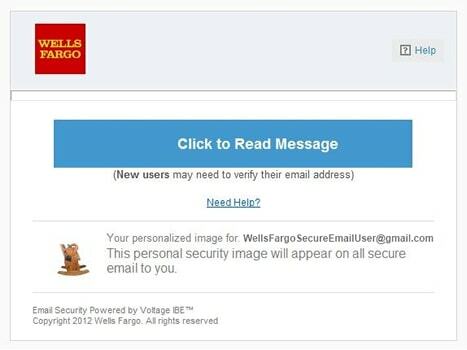 Your Wells Fargo Secure Email will always contain a personalized image so you can be confident that the message you receive is legitimate. If you receive a suspicious email claiming to be from Wells Fargo, forward the email to reportphish@wellsfargo.com and delete it. Learn how to recognize fraudulent emails. If you receive a Secure Email from Wells Fargo, please refer to the instructions within the email or follow the steps below to access, open, or respond. You may also view a User Guide (PDF). View a User Guide (PDF) or follow the instructions below. To open a Secure Email, you don’t need to install software or plug-ins; however, you must be connected to the internet. If you’re prompted to Save or Open the attachment, select Open. You may receive a warning message; if so, select Open. Once on the screen shown below, select Click to Read Message. If you’re a new user, you may be asked to verify your email address. You may receive the message You are submitting information to an external page. Are you sure? If so, select Ok.
At this point, first-time users will be asked to create a Secure Email account. Returning users will be asked to enter their password. From your tablet or mobile device, view instructions unique to your device. You can also view a User Guide (PDF) or follow the steps below. If the Voltage Secure Mail app is not available for your mobile or tablet device, you may be able to open the Secure Email attachment (message_zdm.html) using your mobile web browser. Please refer to Open a Secure Email – From a Desktop or Laptop as this experience is very similar. If you’re unable to open the Secure Email from your mobile web browser, please open the message from a computer. Once the Voltage Secure Mail app is installed on your mobile or tablet device, return to the Secure Email message in your inbox. Press the attachment (message_zdm.html) and choose to open the attachment in the Voltage Secure Mail app. 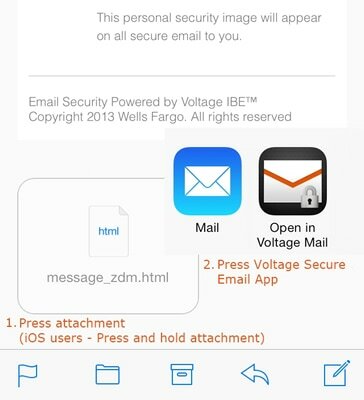 iOS users will need to press and hold the attachment (message_zdm.html) in order to be prompted with the option to open the attachment within the Voltage Secure Mail app. Follow the screen prompts to configure the Voltage Secure Mail App. You may be asked to create a 4 digit pin to access the app. 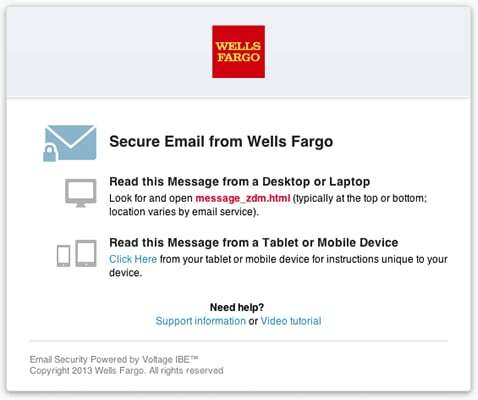 If you’ve received a Wells Fargo Secure Email before, login using your normal Secure Email password. Otherwise, you’ll need to create a Secure Email account. You won’t be able to create a new Secure Email message from the Voltage Secure Mail App, but will be able to reply to or forward a Secure Email message that is sent to you. At this time, the Voltage Mail app is view-only and does not allow for the editing and annotation of attachments. The best practice for secure email collaboration is still through a desktop or laptop computer. If you’ve never received a Wells Fargo Secure Email before, you’ll first need to create a secure email account. The first time you receive a Wells Fargo Secure Email, you’ll be prompted to complete a one-time sign-up form. On the Create Password screen, complete the Full Name and Email fields. Choose a password reset question from the dropdown menu. Provide the answer to your password reset question. 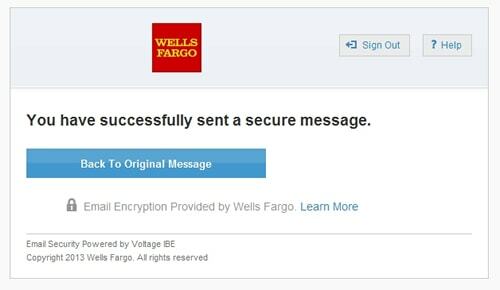 Once you’ve created your account, you’ll be able to open and view the Wells Fargo Secure Email message. Select Reply, Reply to All, or Forward at the top or bottom of your Secure Email. Compose your response and add an attachment if desired. Note you cannot add an attachment from a tablet or mobile device. Desktop or laptop users will receive the confirmation message below when the email is securely sent. All users will receive a copy of the message in their inbox. Select Click here to Reset Your Password on the Login to Read Your Secure Email screen. If you know the answer to your Recovery Question, type in the Answer, and click Continue on the Reset Your Secure Email Password screen. On the Reset Your Password screen, enter and verify a new password. Choose a new Recovery Question and Answer, or leave the Answer field empty if you’d like to keep your current answer. Click Continue and you’ll receive an email from do-not-reply@wellsfargo.com to inform you that your password has been reset. If you don’t know the answer to your Recovery Question, select Click Here to Reset Your Account on the Reset Your Secure Email Password screen. Check your email for a message from do-not-reply@wellsfargo.com. Click the link in the message to reset your account immediately. The link will take you to the Reset Your Password form. Type and verify your new password, select a new Recovery Question and Answer, and click Continue. You’ll receive an email from do-not-reply@wellsfargo.com to inform you that your password has been reset. If you’re unable to open or read a Wells Fargo Secure Email, follow the steps below to troubleshoot. If you’re still unable to open the message, contact the Wells Fargo team member who sent you the message for assistance. Wells Fargo will automatically log you off from your secure email session after a period of 15 minutes. This reduces the risk of others accessing your information from your unattended computer or mobile device. For your security, always log off manually when leaving your device unattended. Make certain your login email and password are correct. These login credentials are unique and aren’t used to access any other Wells Fargo application. Refer to Reset your Secure Email password above to reset your password or login credentials. You must have an internet connection to open and read Wells Fargo Secure Email. 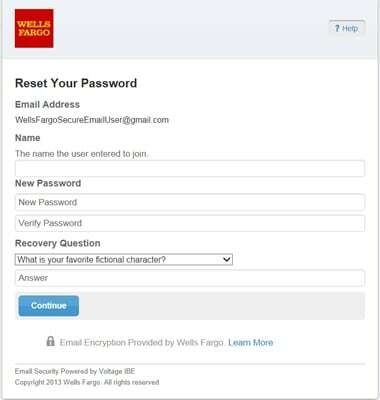 Wells Fargo uses the internet to validate your login ID and password every time you open a secure message. If you lose your internet connection, please attempt to open the attachment once you reconnect. 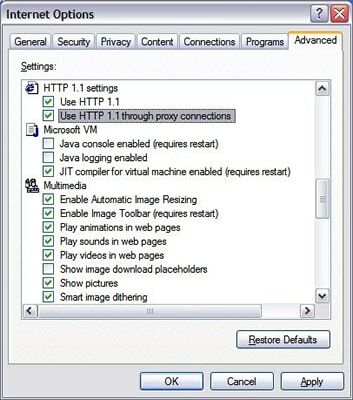 Adjust your HTTP 1.1 settings (only applicable if using Internet Explorer web browser). If you receive a Page Cannot be Displayed error message when attempting to open a Secure Email from Wells Fargo, your browser settings may need to be adjusted. On your internet browser menu, go to Tools > Internet Options and select the Advanced tab. Scroll down to HTTP 1.1 settings and ensure both boxes are checked. Try again to open your Secure Email. Clear cookies and temp files. Instructions for Internet Explorer users are below. On your internet browser menu, go to Tools>Internet Options and select Delete (under Browsing History). Ensure Temporary Internet Files and Cookies are checked and select Delete. Wells Fargo Secure Email can be used with most internet browsers.